Sa Sa Malaysia has recently launched some new products from the CAUDALIE VINOSOURCE range into their stores. I was lucky to be invited to their bloggers tea party for it's launch. Sa Sa is the specialty beauty retailer founded in Hong Kong in 1978. Now, celebrating its 13th Anniversary in Malaysia, Sa Sa Malaysia operates 34 Sa Sa stores, 4 Selecti've by Sa Sa, 1 beauty hall with 2 exclusive skin care counters and 1 outlet, and is accessible to more shoppers than ever before. Sa Sa Malaysia is recognized by The BrandLaureate Awards 2010-2011 as the Best Brands in Retail (Cosmetic & Skincare) for Brand Excellence in Corporate Branding. 15 years ago, Caudalie and Professor Joseph Vercauteren established an exclusive worldwide patent for extracting and stabilizing grape seed polyphenols. These polyphenols are the best anti-oxidants in the plant kingdom and can only be found in the vine, protecting against external damage and enabling this plant to exist for centuries. Today, Caudalie's Reseach Lab have unveiled the extraordinary ability of the vine to regulate its water reserves in the dephts of its shoots to resist climatic variations. This discovery has given rise to an ultra-natural formula with an Quenching Sorbet-Creme, soothing and anti-oxidant. 3 Key active ingredients from the vine: Grape water, an intense water-patch. Vinolevure, to reduce skin's sensitivity. Grape-seed Polyphenols, provide an anti-oxidant shield. These 3 key ingredients work together to help skin regulate its water reserves and reduce sensitivity. Vinosource Quenching Sorbet-Creme has been subject to clinical tests which conducted on 93 volunteers demostrated exceptional effective results. Exceptional hydration power; both immediate and long-lasting; a non-irritating, hypoallergenic treatment that respects the skin; a non-comedogenic treatment; a treatment acclaimed by women that more hydrated skin, soothed skin, stronger skin, less sensitive skin and softer skin. How to use Caudalie Vinosource Quenching Sorbet-Creme? It is selling at all Sa Sa and Selecti've by Sa Sa at RM120 for 40 ml pump dispenser. 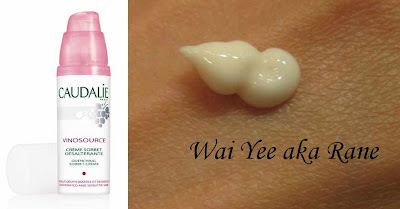 Vinosource range also comes with anti-wrinkle nourishing cream which is suitable for dry skin, 40 ml at RM155. Anti-wrinkle ultra-nourishing cream, 40 ml at RM165. Nourishing Concentrate 15 ml at RM150, and Moisturising cream-mask 50 ml at RM125. Yummy food at Tea Party, thanks Sasa!